One to keep and one to toss! The Strawberry and Chocolate Two Piece Garter Set is a delicious way to have your cake and eat it to. 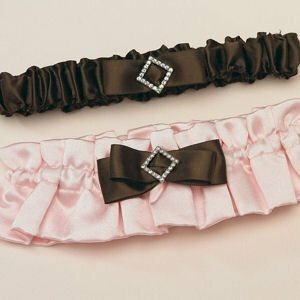 Beautiful crystal detail set atop a chocolate colored satin bow make the soft strawberry pink satin keepsake garter extra special. The chocolate brown toss garter features a much simpler design and is accented simply with a satin bow.